From Inversnaid retrace your steps to Stronachlachar. Pedestrians can follow the old military road. The next part of the journey can be made either by the ‘Sir Walter Scott’, or by cycle by the head of Loch Katrine to Trossachs Pier. Cars must return to Aberfoyle, and cross the Duke’s Pass to reach The Trossachs. Scottish Water maintains the ‘Sir Walter Scott’ on Loch Katrine. In the mornings nowadays it plies between the Trossachs Pier and Stronachlachar, where it may be boarded for the return journey. Round trips from Stronachlachar involve an overnight stay! In the afternoons the vessel makes a round trip without calling at Stonachlachar. This remarkable steamship was built in 1900. It is coal fired; oil being regarded as pernicious by the Water Board. It is the oldest vessel of its kind afloat. The excursion is the best way for the motorist or the pedestrian to see the loch. From Stronachlachar it is a short walk to Wordsworth’s Point. It follows the private road to Glen Gyle. Beyond the houses it circumvents a charming bay and reaches a promontary from which most of the upper part of the Loch can be seen. Across the loch there is a view of ‘Rob Roy’s Grave’ where Wordsworth, mistakenly, thought the outlaw was buried, and Glen Gyle, his birthplace. 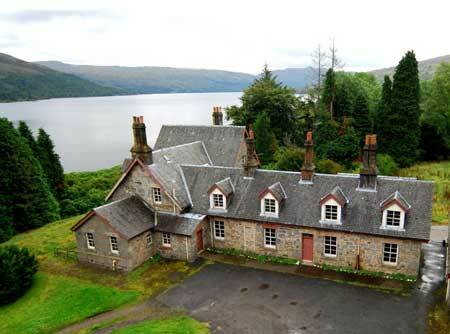 A longer walk leads by the head of the loch past the house to the graveyard and back. There are fine views of Glen Gyle dominated by Ben Ducteath; attractive waterfalls, if it has been wet; and of the upper part of Loch Katrine which is much more attractive than generally allowed. There is also fine circular walk from Stronachlachar following the old road by the head of Loch Arklet with its dramatic views of the Arrochar Alps, to the head of Loch Chon. Thence a track, climbing into the corrie which Patrick Graham suggested was haunted by fairies, follows the aqueduct to Royal Cottage on Loch Katrine. A Water Board road leads back to Stronachlachar. There has been a well-established landing point at Stronachlachar, stonemason’s point, on Loch Katrine, or thereabouts, for more than two hundred and fifty years. Many distinguished visitors have passed that way, and, as already referred to, cursed it for one reason and another. Like all places which enjoy something of a monopoly the incomer’s sense of exploitation is strong. The Hotel is now closed, used by the Regional Council and the Glasgow Corporation before them. A reading of the bye-laws is not recommended: it appears that one is allowed to be there, but one is prohibited from doing anything. Dumps of human excrement, for example, are expressly forbidden. The raising of the level of the loch means that the water is very deep, and the little island offshore, Rob Roy’s Prison (or the Factor’s Island or Eilean Dearg [Red Island]) which is seen close at hand, has a fortified look to prevent it from being washed away. At Stronachlachar the hills on the opposite side of the loch are unimpressive, although a fine peak, Stob a Choin, the dog’s fang, is hidden behind them. The head of the loch is hidden too, but it is not a long walk to a headland from which Glen Gyle can be seen. Across the loch are Glengyle House, Rob Roy’s birthplace, and Portnellan, the first house which he occupied when he was married, and just below which is the graveyard which (erroneously) inspired Wordsworth’s poem,’Rob Roy’s Grave’. The site of the Ferryman’s Hut where the Wordsworth’s stayed is Coilachra, opposite Stronachlachar. The Trossachs for all its nearness to Glasgow remained for Lowlanders a mountainous backdrop, a foreign land where no English was spoken, to be approached by the venturesome only for business reasons – men like the factors from the fringing estates of Menteith, Atholl or Breadalbane, itinerant pedlars, tailors and cobblers, stocking makers, gypsies, iron smelters and their foresters officers on reconnaissance or soldiers on duty. And these knew only the main glens. Glen Gyle, where Rob was born and bred was one of the least accessible valleys in all that country. The flanking hills rose to 2500 feet, but the Parlan Pass, just a thousand feet above his house gave a route of only five miles to Glen Falloch, where at Inverarnan was the night stance, or resting place, for cattle herds driven from Argull to the autumn tryst at Crieff. Smaller herds bound for the markets at Doune, Stirling, or Edinburgh and so by Loch Katrine’s head to Aberfoyle. Seasonal traffic thus passed through the glens which, although now deserted, were intensively cultivated. Murray goes on to describe how the houses belonging to the two MacGregor families in the glen got their names – the black house (Tigh Dubh [The Dow or Dhu]), on the dark southern side of the loch with unmortared walls, and the white house (Tigh Geal [or Gyle]), where Rob Roy was born. The lands at the head of the Parish of Buchanan lying betwixt Loch Lomond and Loch Katrine, are, of all these in that country, the best adapted for concealments, and the most conveniently situated for bad purposes, and they had formerly been possessed by those of that clan. Thefts and depradations were pushed successfully in these places, with an intention, either to turn these lands waste, or oblige that lord the proprietor of them then, by a purchase from the family of Buchanan, to grant leases to those ancient possessors. The scheme purported answered: the sons of Rob Roy got one half of those lands in lease, and Glengyle, the nephew, the other. When these people got possession of these places so well fitted for their designs, they found they were able to carry matters still one point further; in order to which it was necessary that the thefts and depredations should be carried on incessantly through their whole neighbourhood. Things being thus prepared that this MacGregor of Glengyle should keep a Highland watch for protecting that country from these mischiefs, for supporting which he demanded £4 Scots out of each £100 Scots of valued rent. As they had now got possession of these high grounds in a legal way, from whence they could vex the whole neighbourhood, the thing was agreed and a formal blackmail contract entered into between MacGregor and a great many heritors, whose lands lay chiefly exposed to these depredations, and which enabled him, when the troubles of 1745 began, to raise about forty men for that service, with which this same man put the country upon the Water of Endrick, Dundas, Strathblane, and other places, undercontributions, and opened the first scene in that fatal tragedy, by surprising the Barracks of Inversaid, and part of General Campbell’s regiment, which was working at the Inverary roads. A person who had the greatest correspondence with the thieves was agreed upon to preserve the lands contracted for from thefts, for certain sums to be paid yearly out of these lands. Upon this fund he employed one half of the thieves to recover stolen cattle, and the other half of them to steal, in order to make this agreement and blackmail contract necessary. We mentioned Rob Roy, and the eyes of all glistened; even the lady of the house, who was very diffident, and no great talker, exclaimed, “He was a good man Rob Roy!” He had been dead only about eighty years, had lived in the next farm, which belonged to him, and there his bones were laid. He was a famous swordsman. Having an arm much longer than other men, he had a greater command with his sword. As proof of his length of arm they told us that he could garter his tartan stockings below his knee without stooping, and added about a dozen diffferent stories of single combats, which he had fought, all in perfect good humour, merely to prove his prowess. I daresay they had stories of this kind which would hardly have been exhausted in the long evenings of a whole December week, Rob Roy being as famous here as ever Robin Hood was in the Forest of Sherwood; he also robbed from the rich, giving to the poor and defending them from oppression. They tell of his confining the factor of the Duke of Montrose in one of the islands of Loch Kathrine, after having taken his money from him – the Duke’s rents – in open day while they were sitting at table. He was a formidable enemy of the Duke, but being a small laird against the greater, was overcome at last, and forced to resign all his lands on the braes of Loch Lomond, including the caves which we visited, on account of the money he had taken from the Duke and could not repay. A fine body of water in an elbow bend, but the mountains were all too dreary and not very impressive in their forms and combinations. There was wood on them but a total want of cultivated land and happy cottages. This first reach of the lake, perhaps two miles in length has four islands, sweet bays and island-like promontories, one shaped like a dolphin and another like a sea-lion. I had twelve years ago been sent on an errand to the house of Glengyle, to ask permission of MacGregor, the laird, to go through his land with a drove of sheep. he was then an old man, and seemed to me to be a very queer man; but his lady granted nmy request without hesitation, and seemed to me an active social woman. theefore I expected from the idea that I had formed of her character, to be very welcome there, and never knew, until I went to the house, that the laird was dead, and the lady and her family removed to the neighbourhood of Callander; while the farm and mansion-house were posessed by two farmers. When I called one of them came to the door. I asked the favour of a night’s lodging: but the important McFarlane made use of that decicive moment to ask me half a score of questions before he desired me to walk in. McAlpin, the other farmer, I found to be a very considerable man, both in abilities and influence, but the most warm and violent man in dispute. Hogg goes on to relate how McAlpin had once refused to accommodate five Glasgow gentlemen. There is nothing about Glengyle that admits of particular description. it is situated at the head of Loch Katrine and surrounded by black rocks. It was one of Rob Roy’s principal haunts, to whom Glengyle was related. McAlpin showed me the island in Loch Katrine where he confined the Duke of Montrose’s steward, ofter robbing him of his master’s rents and where he nearly famished him. The MacGregors have a burial place at Glengyle, surrounded by a high wall. On one of their monuments their coat of arms and motto are engraved. He addressed himself to one who appeared like the master, and all drew near him, staring at William as nobody could have but out of sheer rudeness, except in such a lonely place. He told his tale, and inquired about boats; there were no boats and no lodging nearer than Callander, ten miles beyond the foot of the lake. A laugh was on every face when William said we were come to see the Trossachs; no doubt they thought we had better stayed in our own homes. William endeavoured to make it appear not so foolish, by informing them that it was a place much celebrated in England, though perhaps little thought of by them, and that we only differed from many of our countrymen in having come the wrong way in consequence of an erroneous direction. In fact they were hospitably received by the McAlpins and the MacFarlanes and the Journal gives a substantial account of the condition of a house occupied by gentlemen-farmers in those days. They were misinformed about Rob Roy’s Grave here, as well as by the ferryman at Coilachra, Gregor MacGregor, to whom they were directed the following morning. These two poems, which are often confused with one another, by others, because their subject matter seems as if it might be the same, are connected, respectively, with Inversnaid and Loch Voil. He was sought upon all sides on a charge of carrying a young woman from Balfron and marrying her (as was alleged) by force; yet he stepped about Balquidder like a gentleman in his own walled policy. It was he who had shot James Maclaren at the plough stilts, a quarrel never satisfied; yet he walked into the house of his blood enemies as a rider (commercial traveller) might into a public inn. Here was a very different valley from that of Inversnaid, a true glen, deep and narrow, between soaring rugged peaks, through which raced a sizeable river in rushes and falls and linked gleaming pools. It was a place of scattered open birch-woods and hazel- fringed water-meadows, of great outcropping rocks as big as house, and long sweeping grassy aprons scored by burnlets innumerable. Five miles it stretched, all seen clearly from up here, from the head of fair Loch Katrine at its foot, to where the thrusting shoulder of a mountain divided it neatly into two,upper corries that rose fully five hundred feet above its floor, where the twin headwaters were born. and the whole was dotted with croft-houses with their patches of tilth and their peat-stacks, and cattles grazed high on the hills. Down near the loch shore Gregor’s own house of Glengyle stood amidst amidst its sheltering trees, surrounded by its orchard, its herb garden, its steading and offices, its smiddy and its tannery and its duck-pond, like a hen amongst her brood. She has her own Rob Roy! In honour of that outlaw brave. Or keep his friends from harm. He sought his moral creed. Said generous Rob, “What need of books? That tells me what to do. And those that travel on the wind! In peace, and peace of mind. The MacGregor is gone – to return never, never. Sir Walter Scott or the real person, or, sometimes, a legendary figure . Sites associated with Rob Roy in the Loch Lomond and the Trossachs National Park are asterisked . This scene is situated but a short distance from Aberfoyle, and is admirably suited for such an adventurous escape as Rob Roy is described to have achieved in the passage of the river. Both above and below the shallower passage which is used as a ford, the river winds in deep eddies under steep banks of clay, which the water has scooped into many obscure hollows, oveshaded by a thick tangling of uderwood, so as to be quite safe from the approach of cavalry. The only exercise which my imagination received was, when some particular turn of the road gave us a partial view, to the left, of a large assemblage of dark-blue mountains stretching to the north and north west, which promised to include within their recesses, a country as wild perhaps, but certainly differing greatly in point of interest, from that which we now travelled. *”Rob Roy” – Former steamer on Loch Katrine; the MacGregor’s motto ‘S’rioghail mo dhream’ [royal is my clan] was carved round the wheel. Succeeded in 1900 by the “Sir Walter Scott”, the present vessel. Before leaving Stronachlachar a visit should be paid to Royal Cottage, Culligart which was deemed to be the most suitable place for drawing the water from Loch Katrine into the aqueduct which takes it to Glasgow. The construction involved in the Glasgow Corporation Waterworks Scheme was the occasion for a good deal of ceremony. The scheme was begun with a ceremony on the ridge between Loch Katrine and Loch Chon in May, 1856, and, remarkably enough, finished in 1859. The scheme was declared open by the Queen and the Prince Consort, who arrived via Callander, in October of that year. Details were given in the local papers of the various routes by which dignatories would arrive at the remote spot chosen for the opening. One of these routes was, of course, from Stirling via Aberfoyle and Loch Ard. ‘Royal Cottage’ was refurbished for the occasion, and to look at it, one might suppose that the party were to stay for at least a week. In fact they had lunch there. The weather was appalling with thick mist and heavy rain. There was a predictably pompous address from the bailies of Glasgow, and the Queen responded in a simpler fashion, saying, in effect, that she was pleased to be associated with any scheme to reduce the number of her subjects who were unwashed. The proceedings concluded with, as the Stirling Journal put it, ‘a long prayer’ from the local minister. It was not until 1869 that Queen Victoria saw Loch Katrine under favourable conditions. It is impossible to convey to those who have not personnally inspected it, an impression of the intricacy of the wild and beautiful district through which the aqueduct passes for the first ten or eleven miles after leaving Loch Katrine. After finding the narrowest point at which the ridge between Loch Katrine and Loch Chon could be pierced, the country consists of successive ridges of the most obdurate rock, separated by deep wild valleys, in which it was very difficult, in the first instsance to find a way. There were no roads, no houses, no building materials – nothing which would ordinarily be considered essential to the successful completion of sa great engineering work for the conveyance of water; but it was consideration of the geological character of the material which gave all the romantic wildness to the district at once determined me to adopt that mode of construction which has been so successfully carried out. For the first ten miles the rock consists of mica schist and clay slate – close, retentive material into which no water percolates, and in which, in consequence, few springs are to be found. This rock when quarried was unfit for building purposes: there was no stone of a suitable description to be had at any reasonable cost or distance, no lime for mortar, no clay for puddle, and no roads to convey the material. Ordinary surface water construction was therefore out of the question; but I saw that if tunnelling were boldly resorted to, there would be no difficulty, beyond the cost and time required in blasting the rocks, in making a perfectly watertight and all-enduring aqueduct; there would be no water to hamper and delay us in the shafts and tunnels, and little would require transporting to the country but gunpowder and drill iron. This course was therefore determined upon, and my expectations have been realised to the very letter. The aqueduct may be considered as one continuous tunnel. as long as the work continued in the primary geological measures, we had no water; and even after it entered old red sandstone, and where it subsequently passed through trap rock, there was much less than I expected; so that our progress at no part of the work was very materially interfered with by those incidents which usually render mining operations costly and uncertain. The scheme was expanded by raising the level of Loch Katrine, by providing a second pipeline, and by including Loch Arklet in the scheme between 1885 and 1914, and after the Second World War, by including Glen Finglas. What is remarkable is that, in spite of the changes, which involved the submerging of ‘the Silver Strand’, for example, the landscape which attracted the Wordsworths and Scott has been preserved rather than spoiled, and continues to attract people from all over the world. The ‘all-enduring’ nature of the project can be confirmed; the impressive aqueducts in the Loch Ard forest appear to be as sound today as they must have seemed to the self-confident Victorian engineers. From Loch Chon follow the by-road to Inversnaid. The road joins the road between Stronachlachar and Inversnaid which was for long closed to any traffic except coaches between Loch Lomond and Loch Katrine which were used by countless tourists. The road passes Loch Arklet, from the head of which there is a memorable view of the Arrochar Alps across the trough occupied by Loch Lomond, and, at the foot of the loch, the site of the old fort at Inversnaid. There is a picnic site just beyond the picturesque church and ample car parking at the foot of the hill by the hotel. Hans Christian Andersen, Thomas Carlyle and Alexander Smith, and others, have left accounts of their journeys along the road. The road to Inversnaid leads along the banks of Loch Chon. Although it is in its natural state, the tourist will find that under the care of one of Mr Blair’s experienced men he can be driven to Inversnaid with ease and safety, while the ever changing scenes of beauty and magnificence rising around him on every side will more than reward him for all the little difficulties he may have to encounter. It is expected that, in a short time, the Duke of Montrose will have the road in such a state of repair that Mr Blair [Proprietor of the Bailie Nichol Jarvie, and other hotels] will be enabled to run a coach from Aberfoyle to Inversnaid. It is difficult not to suppose that Jules Verne (1828-1905), visiting Loch Katrine in 1859, was not told about the Loch Katrine aqueduct, the construction of which reached its culmination that year. Like every other visitor to the Trossachs, he also heard about the subterraneans, and about the fairy spirits which haunt the Trossachs. Verne mixed all this up and created a world in which Loch Katrine emptied itself into a huge underground cavern in his adventure story Les Indes Noires, the Black Diamonds. The novel was recently republished as The Underground City. Verne, who saw coalmines in Clackmannanshire, was mistaken in believing that the coal measures extended north of the Highland Line. However, the novel is very convincing of its kind, and it has to be admired as a feat of the imagination. Verne’s technique includes using a monster, the Sylfax, and using his knowledge of the mining industry to make the story a painless account of technicalities, but it is the underground city inhabited by ‘subterraneans’ which captures the imagination. Seven miles to the south west of Callander opened a slanting tunnel, adorned with a castellated entrance, turrets and battlements. 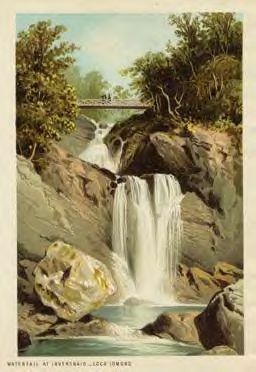 While breakfast was being prepared, Nell and her friends went to look at the waterfall which, from a considerable height, is precipitated into the loch, appearing just as if it had been put there as an ornament on purpose for the pleasure of the tourists. A suspension bridge spanned the tumultuous waters amidst clouds of spray. From this spot the eye surveyed the greater part of Loch Lomond, and the ‘Sinclar’ seemed quite small beneath. Breakfast over, they made ready for the drive to Loch Katrine. At the Breadalbane Arms (it was the family of Breadalbane which promised to ‘afford wood and water’ to the fugitive Rob Roy) several comfortable carriages awaited the orders of travellers, affording all the convenience which distinguishes the coaching service of Great Britain. A splendid coachman in scarlet livery gathered up the reins of his four horses in his left hand, and the equipage began the ascent of the steep mountainside, the road following the windings of the bed of the torrent. As they ascended, the form of the mountain peaks seemed continually changing. On the opposite shores of the lake they rose with ever increasing grandeur, the heights of Arrochar overlooking the Inveruglas glen and Ben Lomond now exhibited the abrupt face of its northern side. Verne stuffs the book with this kind of descriptive writing, and the action is brisk enough, but the novel, which is not even one of his best efforts, is forgotten. The fantastic elements in the story, imaginative as they were, were not as spectacular as those in some of his other works, but it is a testimony to the fame of the Trossachs that they were the setting for this French romance. Verne also wrote a poem about the Highlands with references to Scott and the Trossachs. Oak leaves for my pillow. And moss for my bed. And lull me to rest. To coo me to sleep. Or wher’er my footsteps roved. Only strong and stronger grew. For they’re both supremely loyal! And, by birthright, both are mine! The coachman walked along side the horse; one moment we reeled and jolted downhill at a wild speed, the next we were slowly being tugged up hill; it was a journey the likes of which I have never seen elsewhere. There was not a house to be seen, and we did not meet a soul; all around us there were the silent gloomy mountains shrouded in mist; monotonous and always the same. The one and only creature we saw for miles was a lonely shepherd, who was bitterly cold, and wrapped himself in his grey plaid. Silence reigned over all the landscape. Ben Lomond, the highest mountain peak, finally broke through the mist, and soon we could see Loch Lomond below us. Although there was a sort of road leading down, the descent was so steep that it was extremely dangerous to go with a carriage; it had to be left behind, and on foot we approached the well-equipped inn where a crowd of people were waiting for the steamer to arrive. Sailing up Loch Katrine, in the top or unpicturesque part, Irving and Pears settled with us that only we two should go across Loch Lomond, round by Tarbet, Roseneath, Greenock; they meanwhile making for Paisley; and so on stepping out, and paying our boatman, they said adieu, and at once struck leftwards, we going straight ahead; the rendezvous to be in Glasgow again, on such and such a day. The heath was bare, trackless , sun going almost down; Brown and I had an interesting march of it, good part of it dark, and flavoured to just the right pitch with something of anxiety and sense of danger. The sinking sun threw its reflexes on a tame-looking House with many windows, some way to our right – the ‘Kharrison of Infersnaidt’, an ancient Anti-Rob Roy establishment, as two rough Highland wayfarers had lately informed us; other house or person we did not see; but made for the shoulder of Ben Lomond and the Boatman’s Hut, partly, I think, by the stars. Boatman and Huthold were in bed; but he with ragged little sister or wife cheerfully roused themselves; cheerfully, and for the most part in silence, rowed us across(under the spangled vault of midnight, which with the lake waters silents as if in a deep dream, and several miles broad here, had their impression on us) to Tarbet, a most hospitable, clean and welcome little country inn(now a huge ‘Hotel’ I hear, – worse luck to it, with its nasty ‘Hotel Company Limited’!). On awakening next morning I heard from below the sound of a churn; prophecy of new genuine butter, or even of ditto rustic buttermilk. Brown and I did very well on our separate branch of pilgrimage; pleasant walk and talk down the west margin of the Loch(incomparable among lochs or lakes yet known to me) past Smollett’s Pillar; emerge pleasantly on Helensburgh, on the view of Greenock, and across to Roseneath Manse where we were warmly welcomed and well entertained for a couple of days. You soon reach the wharf and after your natural rage at the toll of twopence exacted from you on landing has subsided and you have had a snack of something at the inn, you start on the wild mountain road towards Inversnaid. The aspect of the country has now changed. The hills around are bare and sterile, brown streams gurgle down their fissures, the long yellow ribbon of road runs away before you, dipping out of sight sometimes and reappearing afar. You pass a turf hut and your nostrils are invaded by a waft of peat reek which sets you coughing and brings the tears into your eyes; and the juvenile natives eye you askance and wear the airiest form of the natrional attire. In truth, there is not a finer bit of highland road to be found anywhere than that which runs between the inn – which, like the Russian heroes in Don Juan, might be immortal if the name could be pronounced by human organs, and the hotel at Inversnaid. When you have travelled some three miles the scenery improves, the hills rise into nobler forms with misty wreaths about them and as you pursue your journey a torrent becomes your companion. Presently, a ruin rises on the hillside, the nettles growing on its melancholy walls. It is the old fort of Inversnaid, built in King William’s time to awe the turbulent clans. Nothing can be more desolate than its aspect. Sunshine seems to mock it; it is native and endued into its element when wrapped in mist or pelted by wintry rain. Passing the old stone and lime mendicant on the hillside – by the way tradition mumbles something about General Wolfe having been stationed there at the beginning of his military career – you descend rapidly on Loch Lomond and Inversnaid. The road by this time has become another Pass of Leny: on either side the hills approach, the torrent roars down in a chain of cataracts, and ,in the spirit of bravado, takes its proudest leap at the last. Quite close to the fall is the hotel; and on the frail timber bridge that overhangs the cataract, you can see the groups of picturesque-hunters, the ladies gracefully timid, the gentlemen gallant and reassuring. Inversnaid is beautiful, and it possesses added charm in being the scene of one of Wordsworth’s poems; and he who has stood on the crazy bridge, and watched the flash and thunder of the stream beneath him, and gazed on the lake surrounded by mountains, will ever after retain the picture in remembrance, although to him there should not have been vouchsafed the vision of the “Highland Girl”. A steamer picks you up at Inversnaid and slides down Loch Lomond with you to Tarbet, a village sleeping in the very presence of the mighty Ben, whose forehead is almost always bound with a cloudy handkerchief. Although the loch is finer higher up, where it narrows towarsd Glen Falloch – more magnificent lower down, where it widens, many-isled towards Balloch – it is by no means to be despised at Tarbet. Each bay and promontory wears its peculiar charm; and if the scenery does not astonish, it satisfies. The cold and cheerless drizzle in the air. So stunned with grief – long gazed at it we twain. Stare through the rain with strange woe-wildered look. They grace their country’s story. We saw before us at a distance of about half a mile, a very large stone building, a singular structure, with a high wall around it, naked hill above, and neither field nor tree near; but the moor was not overgrown with heath merely, but grey grass such as cattle might pasture upon. We could not conjecture what this building was; it appeared as if it had been built strong as if to defend it from storms; but for what purpose? William called out to us that we should observe that place well, for it was exactly like one of the spittals of the Alps, built for the reception of travellers, and indeed I had thought it must be so before he spoke. This building, from its singular structure and appearance, made the place, which is itself in a country like Scotland nowise remarkable, take a character of unusual wildness and desolation – this when we first came in view of it; and, afterwards, when we had passed it and looked back, three pyramidal mountains on the other side of Loch Lomond terminated the view, which under certain accidents of weather must be very grand. One wet afternoon in late autumn, I reached Inversnaid Hotel from Stronachlachar as the four-in-hand coaches arrived in conjunction with the steamer about to sail down Loch Lomond to Balloch with some hundreds of passengers who had just come through Glen Arklet from Loch Katrine. In and out of these coaches scrambled these passengers by wooden ladders duly adjusted for the purpose, and so mindful of an age that knew nothing of the internal combustion, and very little about the driving power of steam. The horses looked so bored. They drooped their heads in the rain. so well did they appear to know the Glen Arklet road that they gave one the impression that they regarded the drivers as needless supernumeries. the scene belonged to the days of the stage coach, though the noted hotel itself certainly diffused an air of spaciousness and comfort undreamed of by early travellers to these parts. Like something fashioned in a dream. No visitor to Inversnaid should omit the short walk to the waterfall. Crossing the bridge two paths will be found, an upper and a lower, which lead through delectable woods above the loch and can be used in either direction to make a pleasing circular walk. Alternatively the West Highland Way can be followed to, say, Cailness at the heart of ‘Craig Royston’. As Alexander Smith reminds us, it was Wordsworth who brought the world to Inversnaid. The Trossachs, in particular Inversnaid, formed something of a focal point for the Wordsworths’ in Scotland, and the district undoubtedly formed a topic of conversation between Wordsworth and Scott. There are graphic descriptions in Dorothy Wordsworth’s Journal of their visits in 1803. It was this first visit that made such an impression on the poet, although the sonnet, ‘The Trossachs’, was the product of a later visit. The fowls were no worse, but some sugar, ground coffee, and pepper cake seemed to be entirely spoiled. We gathered up as much of the coffee and sugar as we could and tied it up, and again trusted ourselves to the lake. We went a considerable way further, and landed at Rob Roy’s Cave, which is in fact no cave, but some fine rocks on the brink of the lake, in the crevices of which a man might hide himself cunningly enough; the water is very deep below them, and the hills above very steep and covered with wood. The little highland woman, who was in size about a match for our guide at Lanark, accompanied us thither. There was something very gracious in the manners of this woman; she could scarcely speak five English words, yet she gave me, whenever I spoke to her, as many intelligible smiles as I had needed English words to answer me, and helped me over the rocks in a most obliging manner. She had left the boat out of goodwill to us, or for her own amusement. she had never seen these caves before; but no doubt had heard of them, the tales of Rob Roy’s exploits being told familiarly round the ‘ingles’ hereabouts, for this neighbourhood was his home. We landed at Inversnaid, the ferry-house beside the waterfall, and were not sorry to part with our boatman, who was a coarse hard-featured man, and, speaking of the French, uttered the basest and most cowardly sentiments. This extract illustrates perfectly the delights of Dorothy Wordsworth’s Journal. She not only describes the journey, but characterises the inhabitants of the country, and their way of life, with short descriptive pieces which give it lasting interest, and give the characters immortality. The Highland woman who showed them a kindness is remembered in the pages of Dorothy’s Journal forever. Many would rate her achievements to be superior to those of her brother. In combination they are unsurpassed, and, while it is parts of the English Lake District which have benefited most from their writing, the Trossachs, and only one or two other places in Scotland, rate alongside ‘The Lakes’ as scenes celebrated by these two in their most enthusiastic and evocative vein. Inversnaid did not impress them very much when they first encountered it, and there is only a brief reference to it in the Journal at this point. The ferry-house stood on the bank a few yards above the landing place where the boat lies. It is a small hut under a steep wood, and a few yards to the right, looking towards the hut, is the waterfall. The fall is not very high, but the stream is considerable, as we could see by the large black stones which were lying bare, but the rains, if they had reached this place, had had little effect upon the waterfall; its noise was not so great as to form a contrast with bay into which it falls, where the boat, and house, and waterfall seem all protected. A feature of the Journal is the way that Dorothy sets the scene for William’s poems and seems, sometimes, as here, to use the same words in prose as he uses in verse. What we cannot always know is which of the two of them put it that way first, although, in the revealing passage about the Garrison of Inversnaid, quoted above, Dorothy comments that she ‘thought so before he said it’. The two returned to Inversnaid later in their tour when they set off for the west coast, and again on their memorable walk from the ferryman’s cottage on Loch Katrine by Glen Falloch to Glen Glyle, involving two ferries and the ascent of a hill pass, 424 metres in height. This walk, one of the finest ‘low-level’ walks in the Southern Highlands, is best attempted these days from Inversnaid. This remarkable pair did not seem to distinguish between Sunday and any other day in the week which, in the Highlands at the opening of the nineteenth century, was remarkable. Thus they set off the first time, with Coleridge, on a wet Sunday morning. Not surprisingly they had to wait all day in the ferryman’s cottage for the boat to return from taking the inhabitants of the Garrison of Inversnaid to church on the other side of Loch Lomond. Wordsworth’s famous poem ‘To a Highland Girl’ is a celebration of one of two sisters who looked after them in the hut on that wet day when they had got themselves soaked travelling from Stronachlacher. When beginning to descend the hill towards Loch Lomond we overtook two girls, who told us we could not cross the ferry till evening, for the boat was gone with a number of people to Church. One of the girls was exceedingly beautiful; and the figures of both of them, grey plaids falling to their feet, their faces only being uncovered, excited our attention before we spoke to them; but they answered us so sweetly that we were quite delighted, at the same time that they stared at us with an innocent look of wonder. I think I never heard the English language sound more sweetly than from the mouth of the elder of these girls, while she stood at the gate answering our inquiries, her face flushed with rain; her pronunciation was clear and distinct; without difficulty, yet slow like foreign speech. The hospitality we had met on us this our first entrance into the Highlands and on this day, the innocent merriment of the girls with their kindness to us, and the beautiful figure and face of the elder, comes to my mind whenever I think of the ferry house and waterfall of Loch Lomond, and I never think of the two girls but the whole image of that romantic spot is before me, as it will be to my dying day. The description of the day spent at Inversnaid is amongst the most memorable passages in all of Dorothy’s works. And the lake her lone bosom expands to the sky. These verses are adapted to a very wild yet lively gathering-tune, used by the MacGregors. The severe treatment of this clan, their outlawry, and the proscription of their very name, are alluded to in the Ballad. Must be heard, but by night in our vengeful haloo! Then haloo, Grigalach! haloo, Grigalach! Haloo, haloo, haloo, Grigalach, Etc. MacGregor has still both his heart and his sword! Then courage, courage, courage, Gregalach! Then vengeance, vengeance, vengeance, Grigalach! MacGregor, despite them, shall flourish for ever! Come then, come then, come then, etc. Ere our wrongs be forgot or our vengeance unfelt! Our route lay through a dreary yet romantic country, which distress of my own mind prevented me from remarking particularly, and which, therefore I will not attempt to describe. The lofty peak of Ben Lomond, here the predominant monarch of the mountains, lay on our right hand, and served as a striking landmark. I was not awakened from my apathy, until, after a long and toilsome walk, we emerged through a pass in the hills and Loch Lomond opened up before us. I will spare you the attempt to describe what you would hardly comprehend without going to see it. But certainly this noble lake, boasting innumerable beautiful islands, of every varying form and outline which fancy can frame, – its northern extremity narrowing until it is lost among dusky and retreating mountains, – while, gradually widening as it extends to the southward, it spreads its base around the indentures and promontories of a fair and fertile land, affords one of the most surprising, beautiful and sublime spectacles in nature. The eastern side, peculiarly rough and rugged, was at this time the chief seat of MacGregor and his clan, to curb whom a small garrison had been stationed in a central position betwixt Loch Lomond and another lake. The extreme strength of the country, however, with the numerous passes, marshes, caverns, and other places of concealment or defence, made the establishment of this little fort seem rather an acknowledgement of the danger, than an effectual means of securing against it. On more than one occasion, as well as on that on which I witnessed, the garrison suffered from the adventurous spirit of the outlaw and his followers. These advantages were never sullied by ferocity when he himself was in command; for, equally good-tempered and sagacious, he understood well the danger of incurring unnecessary odium. I learnt with pleasure that he had caused the captives of the preceding day to be liberated in safety; and many traits of mercy, and even generosity, are recorded of this remarkable man on similar occasions. A boat waited for us in a creek beneath a huge rock, manned by four lusty highland rowers; and our host took leave of us with great cordiality, and even affection. It was at this time that Rob Roy acquired an interest by purchase, wadset, or otherwise, to the property of Craig Royston already mentioned. He was in particular favour, during this prosperous period of his life with his nearest and most powerful neighbour, James, first Duke of Montrose, from whom he received many marks of regard. His Grace consented to give his nephew and himself a right of property on the estates of Glengyle and Inversnaid, which till then they had held only as kindly tenants. The Duke, also with a view to the interest of the country and his own estate, supported our adventurer by loans of money to a considerable amount, to enable him to carry on his speculations in the cattle trade. Unfortunately this species of commerce was and is liable to sudden fluctuations; and Rob Roy was – by a sudden depression of markets, and, as friendly tradition adds, by the bad faith of a partner named MacDonald, whom he had imprudently received into his confidence, and intrusted with a considerable sum of money – rendered totally insolvent. He absconded – of course – not empty-handed if it be true, as stated in an advertisement for his apprehension, that he had in his possession sums to the amount of £100 sterling obtained from several noblemen and gentlemen under pretence of purchasing cows for them in the Highlands. I had in the summer of 1791 passed through that country with sheep. On a Saturday night we lay with our sheep in the opening of a wood by the side of Loch Ard, and during the whole of the Sabbath following there was so dark a fog, that we could scarcely see over our drove. Although we got permission we did not go by Glen Gyle, but by the garrison of Inversnaid, and the night again overtook us on the top of this hill. The mist still continued dark, and though my neighbour who was a highland man, knew the road, I was quite unconscious what sort of country we were in. When I waked next morning the sun was up and all was clear, the mist being wholly gone. You can better judge of my astonishment than I can express it, as you are well aware what impression such a scene hath on my mind. Indeed it is scarcely possible to have placed me in another situation in Scotland where I could have had a view of so many striking and sublime objects by looking about me. Loch Katrine with its surrounding scenery stretching from one hand; Loch Lomond on the other. The outline of Ben Lomond appeared to particular advantage, as did the cluster of monstrous pyramids on the other side. One hill, in the heights of Strathfillan, called Ben Lui, was belted with snow, and from that direction had a particularly sharp, peaked appearance, being of prodigious height. Besides all this I had drunk some whisky the preceding evening, and had a very distinct recollection of our approach to that place, and it was actually a good while ere I was persuaded that everything I saw was real. I sat about an hour contemplating the different scenes with the greatest pleasure before I awakened my comrade. I was very anxious to be on the same spot again, and went out of my way to reach it, expecting to experience the same feelings that I had done formerly. In this, however, I was disappointed, but was not a little surprised on recollecting the extraordinary recurrence of circumstances as to time and place. It was not only in the same day of the week, but the same day of the same month when I was on the same spot before. The two sabbaths preceding these two days had been as remarkable for mist and darkness, in short my whimsical fortune seemed to be endeavouring to make me forget the twelve years which had elapsed. But it would not do. Musing on these objects I fell into a sound sleep, out of which I was at length awakened by a hideous, yelling noise. I listened for some time before I ventured to look up, and on throwing the plaid off my face, what was it but four huge eagles hovering over me in a circle at a short distance; and at times joining all their voices in one unconceivable bleat. I desired them to keep at a due distance, for I was not yet dead. 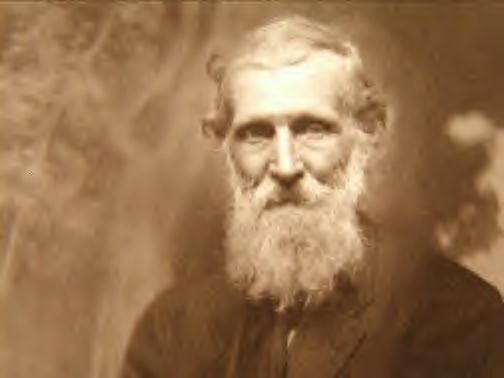 John Muir (1838-1914), the famous founder of America’s National Parks, returned to Scotland from the States and was at Inversnaid (situated, of course, in Scotland’s first National Park) on July 22, 1893. There is a copy of a letter about his visit addressed to Mrs Muir from Station Hotel, Oban which can be seen on the internet. From Kirkintilloch we were to drive to the Broomielaw and catch the Loch Lomond steamer. Alas! we arrived late. The other members of the party – Mr Theodore Walron, then a master at Rugby; Mr Thomas Arnold, then in the foreign office, and on the eve of his journey to the antipodes; and Mr Charles Lloyd, who had been a master at Westminster, and was then a student of Christ Church, and an enthusiastic lover of Scotland, where he spent much of his vacations at Loch Ard – had started from Mr Walron’s house at Calder Park. They had been more punctual than we, and had gone on. What was to be done? It was resolved to take the train to Greenock, and catch the steamer to Arrochar. 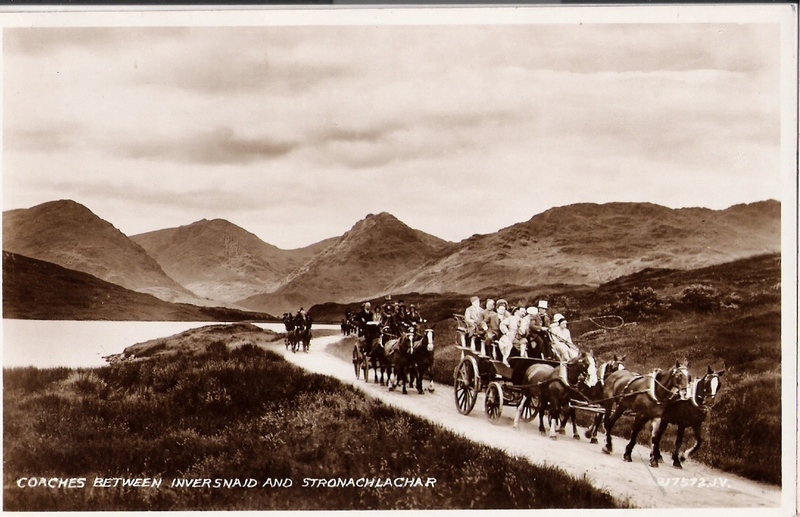 Possibly we might overtake our companions at Inversnaid or the Trossachs. But fate was against us. At the entrance to Loch Long some of the machinery gave way, and we returned hastily to Greenock, thinking ourselves lucky to escape with no worse mishap. The only plan then remaining was to cross to Dumbarton and follow in the steps of our more punctual friends. Accordingly we walked to Balloch, and took the steamer for Inversnaid. Shairp was full of the Highland Girl and the poem Stepping Westward. I believe we slept at Inversnaid, if not at the Trossachs. The idea was to cross to the braes of Balquhidder, and so strike in on the probable route of our companions a Lochearnhead. But fate again was unpropitious. we missed our way, and after crossing the shoulder of Ben Ledi, came down on the Callander road below Strathyre, and had a memorable meeting with our three friends, who were on the road northwards. Close behind the hotel of Inversnaid is the waterfall; all night, my room being on that side of the house, I had heard its voice, and I now ascended beside it to a point where it is crossed by a wooden bridge. there is thence a view, upward and downward, of the most striking descents of the river, as I believe they call it, although it is but a mountain stream, which tumbles down an irregular and broken staircase in its headlong haste to reach the lake. It is very picturesque, however, with its ribbons of white foam over the precipitous steps, and its deep black pools, overhung by black rocks, which reverberate with the rumble of falling water. I rather think this particular stretch of Loch Lomond, in front of Inversnaid, is the most beautiful lake and mountain view that I have ever seen. It is so shut in that you can see nothing beyond, nor would suspect anything more to exist than this watery vale among the hills; except that, directly opposite, there is the beautiful glen of Inveruglas, which winds its way among the feet of Ben Crook (A’Chrois), Ben Ein (Ben Ime), Ben Vain (Ben Vane) and Ben Voirlich (Ben Vorlich), standing mist-enwreathed together. The mists, this morning, had a very soft and beautiful effect and made the mountains tenderer than I have hitherto felt them to be; and they lingered about their heads like morning dreams, flitting and retiring, and letting the sunshine in, and snatching it away again. We now engaged a boat and were rowed to Rob Roy’s cave, which is perhaps half a mile distant up the lake. The shores look much more striking from a rowing boat creeping along near the margin, than from a steamer in the middle of the loch; and the ridge, beneath which Rob Roy’s Cave lies, is precipitous with gray rocks, and clothed, too, with thick foliage. Over the cave itself there is a huge ledge of rock, from which immense fragments have tumbled down, ages and ages ago, and fallen together in such a way as to leave a large irregular crevice in Rob Roy’s cave. We scrambled up to its mouth bysome natural stairs, and scrambled down into its depths by the aid of a ladder. And stout Rob Roy possessed this granite hold. On fraud and force and falsehood to make war. Shaped each hard-sinewed life to kingly plan. Rob Roy saved honest men from being slaves. Scott uses Rob Roy’s Cave in Waverley. Scott stated that he learned about Rob Roy’s Cave from Abercromby of Tullibody who was taken to meet Rob Roy himself. In Waverley the hero is rowed across a loch to meet Donald Bean Lean just as Abercromby was. Flutes and low to the lake falls home.